There's plenty of grand things about going to D.C.'s annual "A Capitol Fourth" -- but braving a jam-packed National Mall doesn't exactly top the list. 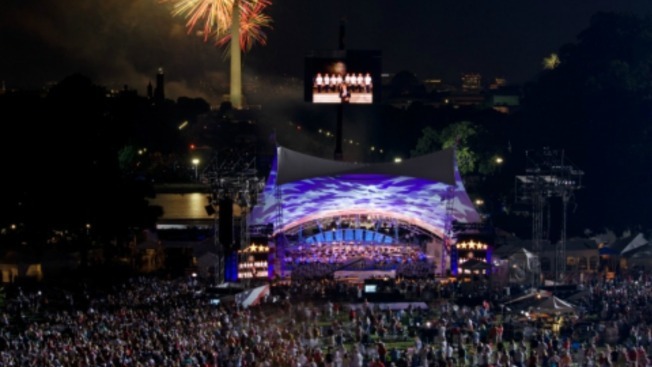 If you want to skip the usual crowd, which swells to about 700,00 people on July 4, head down to the West Lawn of the U.S. Capitol a day early for a dress rehearsal of the performances. You'll see the full concert (minus the fireworks), as artists such as Frankie Valli, Patti LaBelle, Jordin Sparks and Sara Evans prepare for the big Independence Day bash. Tom Bergeron ("Dancing With the Stars") will serve as emcee for this year's concert and composer John Williams will unveil a new version of "The Star Spangled Banner." The rehearsal runs from about 7:30 to 10 p.m. Thursday. It's best to arrive around 6 p.m. Gates open at 3 p.m.
You'll want to be weather-ready, though. Storms and heavy rain are in the forecast throughout the evening, said Storm Team 4 Meteorologist Amelia Segal. The main concerns are flash flooding and strong winds. If you go, be sure to allow extra time. Expect to pass through a metal detector and have police search through all of your bags, picnic baskets, and coolers. Still want to see the real thing? It will start at 8 p.m. on Friday, and the concert will go on rain or shine. However, if it does rain, the fireworks display will be rescheduled for Saturday, July 5.